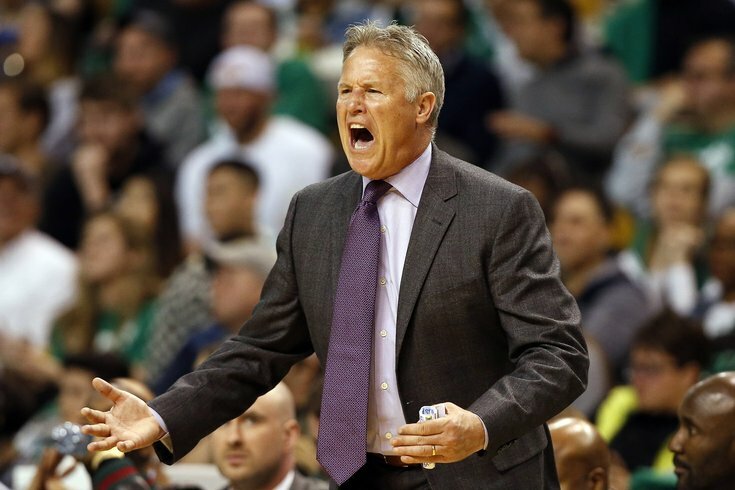 Philadelphia 76ers head coach Brett Brown yells at a referee during the second half of their 117-101 loss to the Boston Celtics in game one of the second round of the 2018 NBA Playoffs at TD Garden. BOSTON — There are all sorts of historical reasons to fear going down 2-0 in a playoff series, let alone to a team with a home crowd as strong as Boston's. But you can throw out all established precedent or franchise context and just focus on a simple reality — if the Sixers lose Game 2 on Thursday night, they will either have to win four consecutive games to win the series or take four out of five, including a Game 7 on the road. That's getting a little ahead of ourselves, but it is no less real of a concern for Philadelphia now than it would be if we reach that point in the next week and a half. And having blown a real opportunity to steal a road win with Jaylen Brown shelved on Monday evening, the hill only gets steeper for the Sixers from here. So Thursday night's Game 2, being played with the aforementioned Brown's status still in doubt, is of critical importance to Philadelphia's season rolling along, their dream year being extended. The one thing they've made clear over the last couple weeks is that they are working from a different set of expectations than they were even a couple months ago, and that coming up short because they're young and inexperienced isn't an acceptable excuse. Will the Sixers rise to the occasion or allow Boston's home court to swallow them up once again? Their response to a few major questions will determine their fate. Will accumulation of rest boost the Sixers as series rolls along? On the players' end of things, no one wanted to point to their downtime between series as a reason for the bad performance in Game 1 against Boston. Their coach has marched to that same drumbeat, primarily focusing on the fact that they did not live up to their end of the bargain from the first through the final man on the bench. But Brett Brown raised an interesting point at Thursday's shootaround, highlighting their previous week of rest as a potential future asset, even if it had hurt them in Game 1. "I wish we'd played yesterday," said Brown. "I think we can all better judge later, because [there's a] possibility that the rest we accrued while we weren't playing, maybe that serves us better as the series unfolds. I can confidently say it didn't help us in Game 1, it didn't even come close to helping us in Game 1, and I respect and give credit to the Celtics for exposing a lot of weaknesses that maybe a lack of rhythm allowed them better to show." This sort of jives with what we know about the human body in general. As one example, the effect of a single good night of sleep is not always apparent the next day, but if you continue to accumulate good nights of sleep eventually you are going to feel refreshed and alert on a more consistent basis. The Sixers pretty obviously did not benefit from the rest in Game 1, but the good news for Philadelphia is that this is a seven-game set, not an elimination-game format like the NCAA Tournament. The series format rewards habits, adjustments, and patterns built over time by both teams. There's no substitute for the rhythm a team forms playing together on a consistent basis, but the young Celtics are coming off a long seven-game set against Milwaukee, and had to jump right back into things with the Sixers afterward. They're on the opposite side of the rest spectrum: maybe the wear-and-tear isn't apparent right away, but there is a chance it rears its head before the series is over. From Philadelphia's point of view, Game 2 would be a good time for that to start. How do the Sixers cope with the Horford matchup better? There was a lot made in the aftermath of Game 1 regarding Al Horford's production and ability to stretch Philadelphia's defense thinner than they'd like. One play in particular brought it all into focus, when Joel Embiid helped too hard on Shane Larkin and left Horford wide open for an important three. This was used as Exhibit A of why Horford was such a matchup issue for the Sixers, and Embiid even went so far after the game as to point to the floor spacing as a difficulty in defending the Celtics. This is no small detail. But JJ Redick pushed back on this idea a little bit at Wednesday's shootaround, noting that Horford's damage was done all over the court, and not just at the top of the arc. "I don't necessarily think other than the one play with Larkin, that wasn't necessarily what hurt us with Horford. He scored and manipulated the game in a variety of ways," said Redick. "In those late reds*, we're going to end up having to peel out and maybe play post D, get into double teams and rotation." *If you've been paying attention this year, you'll know the Sixers color coordinate different areas of the shot clock. This is Redick's way of referring to late-clock situations. The veteran shooter is right, of course. Boston didn't beat Philadelphia like a drum on offense strictly because Horford got a couple open shots from the perimeter, or even because he's capable of operating out there. Philadelphia struggled all over the place against Boston on Game 1, offering little resistance at any spot on the floor. Horford does so many things well enough that he had Sixers players making uncharacteristic mental mistakes. Embiid closed hard on a Horford pump fake late in the first half, and was still in decent enough position to defend him once the big man put it on the floor and drove to the middle of the court. But Robert Covington overhelped on the play, leaving Terry Rozier wide open for one of his seven threes on the night. The answer to the bolded question above is just to show more trust in their guys to win one-on-one matchups, and frankly, to play better. Philadelphia helped when they didn't need to and stood flat-footed when teammates could have used some coverage shaded their way, never looking like they had a grip on what to do or when. Brown made it a point to turn the responsibility on every player who got minutes on Monday, pivoting out of a question about poor bench play to include the whole team. "I don't think anybody played that well, I really don't. The bench is obviously a part of that, but I also didn't play a lot of people extended minutes either," said Brown on Thursday. "As a whole, we didn't play that well on kind of both sides of the ball. We're going to need to change that if we're going to achieve our goal of taking a win and going home." Despite what happened in Game 1, Boston is not a good offensive team, a point which has been proven by their performance all season. Horford is certainly their best player, but even he is not the sort of guy you point to and think he's going to carry you as a scorer in a big game. Boston is filled with opportunistic scorers — players who are quite good at punishing you for making mistakes, but not necessarily capable of creating clean offense repeatedly. The Sixers love to take advantage of their length and quickness by sending help and betting on their guys to recover back to shooters. A change of pace for Game 2 might be playing more like Boston did on Monday, staying home on shooters and living with the results if Celtics players get a bit of separation in the paint. Will offense normalize for both teams in Game 2? Marcus Smart made as many three-point attempts as any Sixers player did in Game 1, which is downright comical given the depth of Philadelphia's shooting and Smart's own limitations from beyond the arc. It's not often you hear a small chorus of groans when a home team's player shoots a three, as Celtics fans did several times on Smart jumpers in Game 1. Consider some of the other production the Celtics got from players from beyond the arc. Boston ran straight up abysmal offense at times on Monday, only to be rewarded for their troubles. Shane Larkin dribbled the air out of the ball for damn near 20 seconds on one second-half possession, and what else could he have ended up with but a pull-up three? We don't have to be charitable here — that's garbage basketball, a garbage effort to create an open shot elsewhere, and was only bailed out by a tough shot. It's one thing to clear out when you have guys like LeBron James and Dwyane Wade, as the Miami Heat did during their run of brilliance at the beginning of the decade, but this poor excuse for an offense is being run by a backup guard who's a career 33.6 percent shooter from deep. That was the most extreme example for the Celtics in Monday's game, and they got more than enough open looks from three to make a nice living for themselves. But if you were betting on a team to shoot well on Thursday night, the Sixers would be the favorite by a pretty considerable margin when you factor in pedigree and sustained success. Boston made 17 threes at better than a 48 percent clip in Game 1, something they have only done seven times in the history of their franchise. The last time they did so? Last April, when they won another Game 1 on their home floor against the Wizards. Washington was able to force a seventh game in Boston by allowing the Celtics to fall back toward normalcy — the Celtics shot 39 percent from three the rest of the series, a good but not unbeatable mark. Everything about Philadelphia's shot profile on Monday night suggests they will progress back toward respectability on the offensive end as Boston comes back to Earth. A lowlight reel of their missed threes is revealing — they missed many shots you'd expect them to make, and created shot opportunities for players they want letting it fly. It would be a lot more concerning for Philadelphia if they weren't able to generate these looks in the first place. That would be an indication that Boston's defensive choice to single cover Embiid and hug the shooters is the correct one, and a philosophical obstacle the Sixers would have to overcome. Give credit where it's due — Boston had the best three-point defense in the league for a reason, and even when they are a step or two behind where they should be they are excellent at bothering shooters late in their release. They will continue to bother Philadelphia's shooters all series and the Sixers will most likely shoot below their usual numbers from deep across the board. "Make more open shots" is not exactly groundbreaking basketball analysis. But the Sixers are not going to shoot 19 percent from three for an entire seven-game series — they had some real tough stretches against the Heat in round one, and they still ended up hitting better than 36 percent of their three-point attempts in the series. The essential facts coming into the series were plain: the point of separation between two elite defensive teams was on the offensive end of the floor, where the Celtics are below average and the Sixers are knocking on the door of the top-10. Stars and prohibitive favorites tend to win in the NBA Playoffs because outlier shooting barrages are not sustainable. The Celtics should have the Sixers feeling the right level of vulnerable heading into Game 2, possessing the knowledge that they are facing an opponent who deserves their respect who may also have already handed out their best offensive punch.